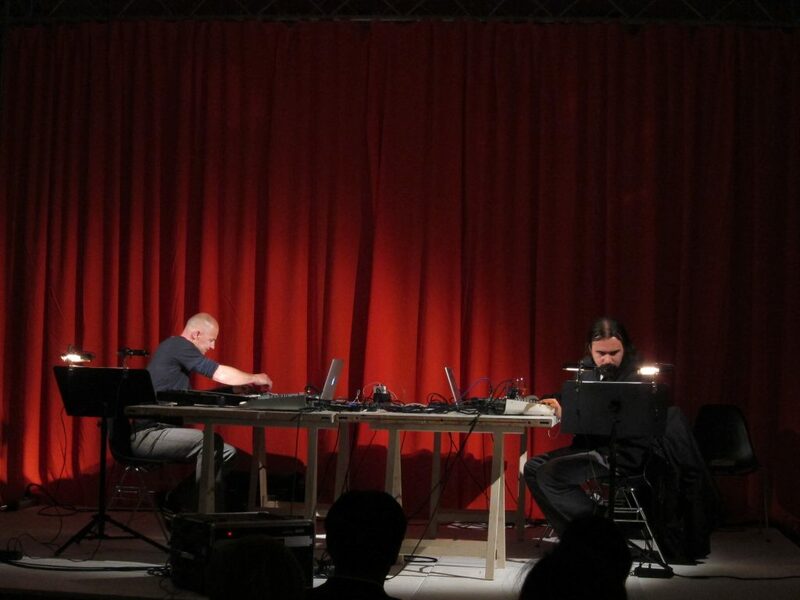 Pleroma – Towards a Borderless Space was a multichannel live soundscape performance conceptualized and performed by Bernhard Loibner and João Castro Pinto. The project figures through the art of live electronic sound-sculpting an artistic reflection on the concepts of limiting, crossing and transcending borders, either culturally, geographically or artistically. Pleroma is a Greek word (πλήρωμα) that means “fullness”. This “fullness” is ascribed in this context as opposing the idea of division, of a false or deluded limit, as a force of being that acts beyond the constraints and limits of borders. The piece was performed live in an 8-channel version at Museum Essl in Klosterneuburg, Austria (near Vienna) on May 4th, 2011. The live performance took place in an installation setting by renown Austrian artist Heimo Zobernig. In the front part of the his exhibition at Museum Essl, a red curtain divides a large pedestal. One side of the pedestal will be used as a stage – at least some of the time. During the exhibition, the installation will repeatedly serve as a concert hall, the music performances being integral components of the show. Space is the constant, the external and internal formal fact, both material and “void”, where time (duration), movement and energy mysteriously act as variables, as accidents that manifest themselves as self-reflection or consciousness. Time is unthinkable without space as is vice versa. It is the entanglement of these two indefinable facts that conducts the possibility of the advent of the unity of human perception. The world itself is a complex space within Space where humans build structures, products, ideas, narratives, countries, borders. All these constructions are rich and full of archetypical meaning. They are based on the principle of identity; nations, cultural signification and art in general are human expressions that intend to reach identity, i.e., they constitute attempts to inscribe in time and beyond it, a determined number of more or less fixed characteristics, that both expand (elevate) and “limit” the specific qualities of a certain people. This idea of determining, of inscribing and limiting is the major imprint of human epistemological condition. Knowledge is about defining and limiting as it affirms itself in terms of its analytical focus, it circumscribes parts of reality in disadvantage of other ones. Therefore knowledge is incapable to grasp the picture in its totality in order to reach an all- inclusive definition of all and everything that exists. In a more profound analysis a conclusion can be reached: these limits, these frontiers or borders are in fact self- imposed and projected illusions of humans. On one hand they forge false division and on the other hand they gather the ideal factual conditions (political-historical- economical, etc…) to create both: distinct cultures and conflicts. Cultures are mainly a product of identity and division but, nevertheless, mankind is one entity: a huge common ground we call culture which is composed by multiple tonalities of different scents and colors / harmonies, a whimsically brilliant, mysterious and infinite spectrum of difference within sameness. Pleroma – Towards a Borderless Space figures through the art of live electronic soundsculpting an artistic reflection on the concepts of limiting, crossing and transcending borders, either culturally, geographically or artistically. Pleroma is a greek word (πλήρωμα) that means “fullness”. This “fullness” is ascribed in this context as opposing the idea of division, of a false or deluded limit, as a force of being that acts beyond the constraints and limits of borders, that understands the dialectic movement of reality as both negation, incorporation / overcoming of different moments or parts of the whole of existence. This performance bases itself formally, in a first stage, on the exchange of field recordings captured by the artists. Both artists will operate a previous repérage that somehow portrays part of the actual soundscapes of the countries involved in this performance: Austria and Portugal. The idea is not to present a sound postcard of the countries (like a sound topography task) but to capture bites and sound images that somehow reveal significant and peculiar aural characteristics of the urban and natural soundscapes in analysis. 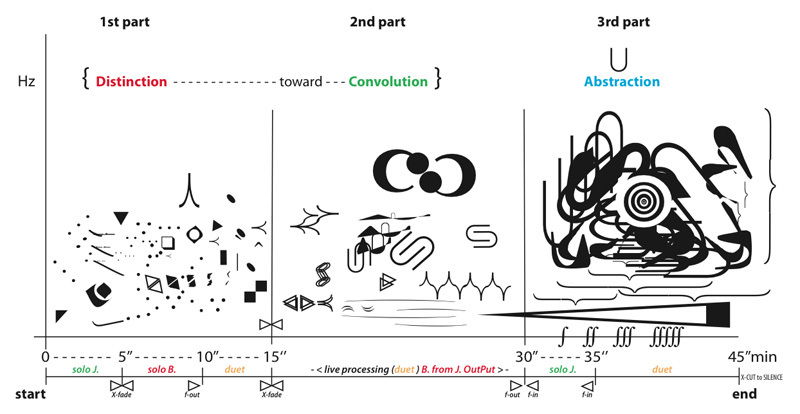 This common pool of sounds, product of the repérage, will then configure a sound library that will be used on the performance as the main sound source, stored in the musicians laptops. With a straight inspiration on musique concrète legacy, but intending to go far beyond it, both artists will then perform sound environments, navigating between macroscopic and microscopic sound structures / objects, presenting contrasting and juxtaposed textures and drones, trying to push forward and transform the natural sounds by complex d.s.p. operations via a common custom built max-msp patch controlled by midi equipment. This patch will be programmed by the artists and establishes also the sound diffusion of the multi-channel system. It will also act as a means of overcoming barriers towards a non-linear form of listening by the audience. Sound will oddly travel in unexpected and modulated ways, in order to create unsettling psychoacoustic situations and also immersive and profound ecstatic moments. To depart from a cultural standpoint to an artistic meaningful reflection is the main goal of: Pleroma – Towards a Borderless Space. This performance intends to be an experience that allows the possibility to transcend borders, the very nature of “limited” Space in itself, through the alchemy of sound. It is an invitation to the audience to fall into deep and active listening, to experience a profound sound voyage.